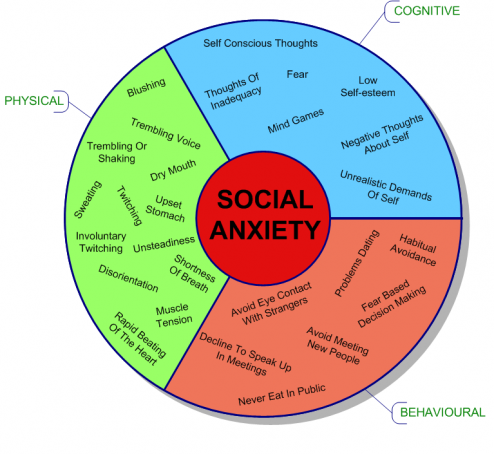 Social Anxiety – what to do ? Why am I socially anxious? One of the things that I have been noticing in my practice is how often people come to see me for social anxiety problems. I also have been aware of how reports seem to indicate this malady to be on the rise in recent times in the western world. So what can we make of this? I have started to question how much of this excessive amount of anxiety is societal and how much is learned behavior coupled with a genetic predisposition. Even without delving into how our societal values vastly influence the importance of social status and its representation through social and traditional media, and even putting aside personal history I am starting to think that a fundamental part of the problem comes from being stuck in the teenage developmental error of assuming and believing that while everyone else is worth knowing and/or has a wonderful life we are not. This makes us feel insecure (and deepens our preexisting insecurities) and puts us in a position of being at -1 in social situations. Let me explain: if we all realized that we are in the same boat and that everyone is as ‘messed up’ and as fundamentally OK as everyone else the way we relate would change. We would stop trying to impress others or being impressed by their seeming social success and we would relate to them as equals; as a result, when talking/meeting a new person we would both start at level 0, not level +1 or -1 (better or worse than them). Step number one then would be to question the fundamental assumption that others are better than us and decide to take a position of fundamental equality. Every time you realize you are putting yourself down when comparing yourself to someone else ask yourself the question: how do I know this is true? Can I prove it? What is the evidence against it? And actively look beyond the surface. Question your own values. What makes you worth knowing is not how much money you have or how thin you are (among other common concerns) but the unique flavor of the way you experience the world. There is no right or wrong way to experience it. There is only genuine communication of your experience and genuine interest in other people’s experience. When we genuinely tell others how we feel about anything we connect as equals, it is easier for others to accept us and as a result, our anxiety assuages. Finally: think about someone who seems at genuine ease with others. What are they doing? Model yourself after their positive qualities you wish to acquire. And when in a difficult situation ask yourself: what would this person do? Now take a leap of faith and do it. Notice what’s different. Persist. Change takes time and effort. You will get out of it as much as you put into it. Some people experience difficulty starting conversations with others, especially when they are strangers. This is not a result of not being interested, interesting or of not having anything to say but it is the result of being scared of rejection. 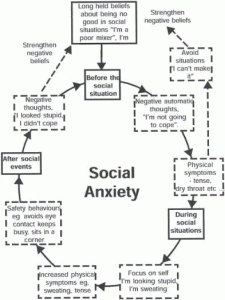 The degrees of social anxiety vary from person to person. Some people find it hard to talk to people in public while they may be ok one on one. Others find it impossible to do everything when others are around. Whether you are naturally less trusting of others and have experienced this problem all your life or you only have this problem in specific situations, hypnotherapy can help uncover the cause of this difficulty and clear any subconscious imprinting that may have made a natural predisposition even worse. When social fear is left untreated it can lead to more serious problems, such as social isolation and eventually, depression or addictions (to relieve the pain of isolation or to numb the fear of rejection). A sense of belonging and personal intimacy are basic needs – just like food and drink – and we all require them to be fulfilled if we are to be happy. Can Hypnotherapy help with Social Anxiety and Shyness? Yes it can. First of all it is important for you to talk in depth about your concerns and specific situation with the hypnotherapist, before any treatment is entered into. Afterwards, when it has become clear what form of anxiety you suffer from the hypnotherapist will use hypnosis to find out what the cause of the anxiety is. Once the cause has been identified and the feelings associated with the triggering event/s have been released, the situation can be reframed and new behavior can be learnt. This is because when underlying issues that cause social fear are dealt with it is easier to learn new ways of dealing with the fear itself. Often self hypnosis will be introduced at this point, together with some simple yet effective breathing techniques that will help you remain calm in situations which you previously experienced as threatening. In addition to that it is likely that the hypnotherapist will guide you through future progressions rehearsals where you ll learn how to create what you want rather than what you don’t want so that you can explore more positive ways of relating to people. If then you feel you want additional help you may get involved with psychotherapists that practice social cognitive restructuring, social skills training, symptoms management skills and supportive counselling, which will also require your friends and family getting involved. Whether you decide to go that way or you find hypnotherapy is enough you’ll have to start putting into practice what you’ve learnt by meeting people and observing how well you can now relate to them. You might need more reinforcement sessions and practice self hypnosis a bit more , but remember that this is a process and it will take the time it takes. Everybody is different, and while hypnotherapy is one of the most effective techniques there are that can help you get a kickstart, it is you, ultimately that need to put the effort in and push yourself beyond your comfort zone from time to time. Remember: nothing of great value is ever achieved without great effort, but the effort is well worth the final result : a sense of personal satisfaction, a capacity to create intimacy, new found confidence and a much bigger horizon of possibilities opening up! There is no better time than now to make that first step. Get in contact with me if you’d like to discuss your issues in more detail or if you wish to make an appointment to tackle your social anxiety once and for all. Find out more how to help yourself overcome anxiety now with some useful tips.